There is a whole set of recommendations on how to protect your wireless router. But this type of protection (hiding the name of Wi-Fi), as well as filtering by MAC address , are not recommended for use, because they cause certain difficulties to legitimate users and do not provide any protection. This material shows the failure of protection by hiding the network. This is the "hidden" Wi-Fi network. 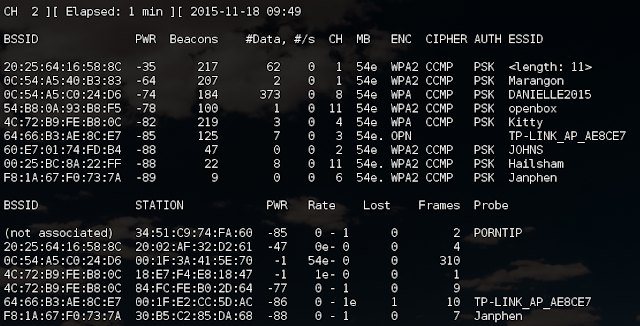 All data, except for ESSID, is available on a par with other access points. 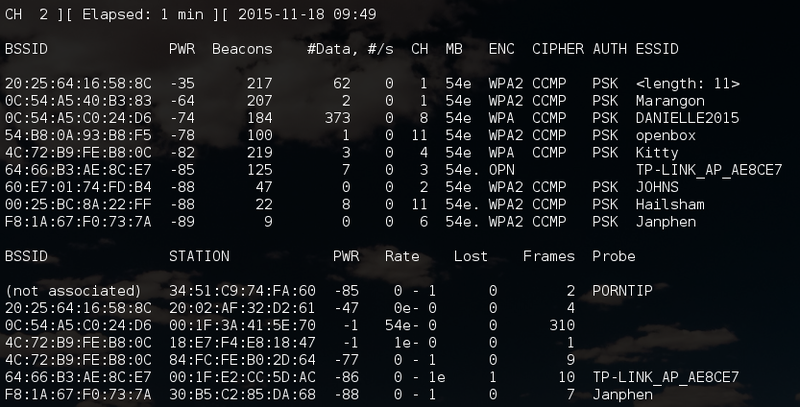 And we already know something about the ESSID: <length: 3> . This means that the length of the name is 3 characters. The network name (ESSID) is transmitted in the broadcast in clear text and can be intercepted during client connection. You can wait for the client to connect in a natural way, or you can speed up the process if you “knock out” ( deauthenticate ) from the access point. After that, it will immediately begin to reconnect, the network name will appear in the broadcast in clear text, and we, in turn, will intercept it. If you remember, when capturing the handshake, I also indicated the -w option followed by the file name prefix. This can be done now - since the seizure of a handshake does not prevent the identification of the name of the hidden AP. In this case, you will kill two birds with one stone at once. Here, -0 means deauthentication, 3 means the number of sent packets, -a 20: 25: 64: 16: 58: 8C is the BSSID of the target AP, and wlan0 is the network interface in monitor mode. Those. 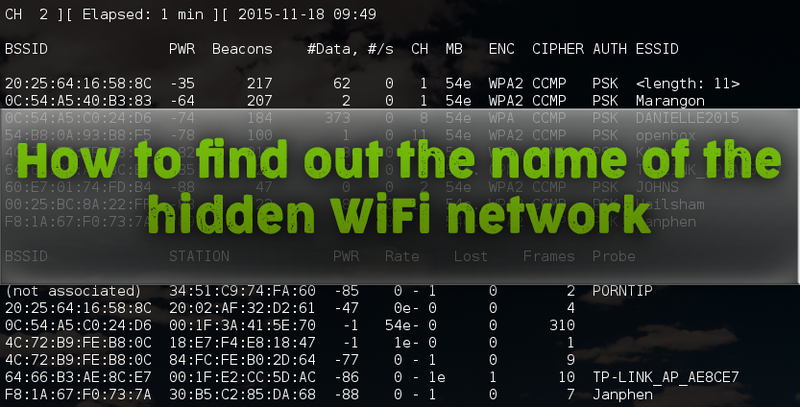 The name of the "hidden" network is SecondaryAP . If you do not use deauthentication attack, then you remain invisible for wireless monitoring systems. If you use the attack deauthentication, then you are unmasking yourself. If you do not use this attack, the disclosure time of the network name is greatly increased. Works in situations where Airodump-ng is powerless. 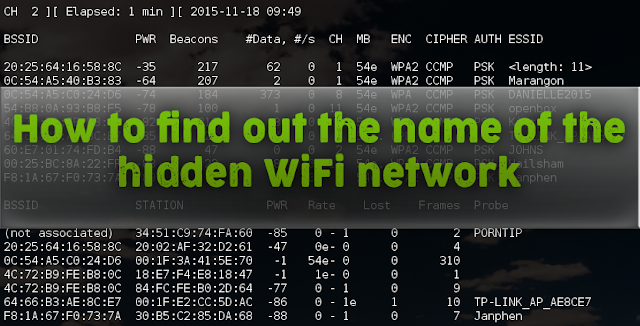 To find the name of the hidden Wi-Fi does not need clients . The selection can be delayed for a long time, especially for long names of Wi-Fi access points. You always unmask yourself, your activity for wireless monitors looks extremely suspicious. Unfortunately, this AP has no clients, so we cannot use the magic of Airodump-ng . Instead, we will use the mdk3 brute force. Most of the options are already familiar to us, except for two new ones: -c 6 means the sixth channel, -bl means the character set, and l means lower case. SSID is hidden. SSID Length is: 3. Got response from 0C:54:A5:C0:24:D6, SSID: "DANIELLE2015"
Got response from 20:02:AF:32:D2:61, SSID: "web"
As you can see, the program just perfectly (and quickly!) Worked. Result received: Got response from 20: 02: AF: 32: D2: 61, SSID: "web" . To summarize Wi-Fi protection by hiding the name of the network (along with filtering by MAC address - see the article “ How to bypass filtering by MAC address ”) are unfit security tools. Nobody forbids their use - they do not weaken the protection. But they do not increase it. In this case, you have to put up with the inconveniences that they cause to legitimate users. If we are talking about filtering by MAC address, then if you add a new client, someone should receive administrative rights for the router and change its configuration. This may not always be acceptable. If you know other programs or methods for obtaining the ESSID - the name of a hidden Wi-Fi network, then you can share them in the comments.